Independent 250 – November 25, 1973: After completing the 1973 NASCAR Grand National season, Chapel Hill, North Carolina’s Ray Williams did something that no other racer dared attempt; he promoted a Grand National race without NASCAR. Williams, an independent owner/driver, had finished 25th in driver standings for the previous season but collected only $22,738 for his efforts. He felt that too much of NASCAR’s financial attention was focused on the corporate sponsored teams at a time when the under funded independent teams were struggling. The country was also in the middle of a recession and gas prices were beginning to spike due to the OPEC oil embargo which began in October. To help generate funds for his fellow independents in the Winston Cup Series, Williams organized and promoted the “Independent 250”, an event held for NASCAR’s independent drivers at Trico Speedway in Rougemont, North Carolina. The rules set by Williams (pictured at right) for the “Independent 250” were simple: no carburetor restrictor plates or engine restrictions (which would allow teams to use the big block engines that were being phased out by NASCAR), a lenient technical inspection policy, no weight handicaps for the cars and usage of standard Grand National width tires. The only race control requirements were single-file restarts and one mandatory pit stop. The entry field included: Dave Marcis, James Hylton, Cecil Gordon, Buddy Arrington, Ray Williams. Bill Dennis, Bill Champion, Henley Gray, Richard Brown, Elmo Langley, Ed Negre, Jabe Thomas, J.D. McDuffie, Bill Seifert, Walter Ballard, Richard Childress, Dean Dalton, Wendell Scott, Earl Brooks, Bill Hollar and Charlie Roberts. Throughout its early years, NASCAR Grand National races were held on every conceivable type of track and surface. NASCAR races would be held at locations that varied from the 2 1/2 mile superspeedway at Daytona to the 1/4 mile track at Winston-Salem's Bowman-Gray Stadium. Grand National races were still contested on many of the old dirt tracks scattered around the south as well. In fact, as late as 1970, NASCAR ran two races at the 1/2 mile dirt track at Columbia SC and one race at the 1/2 mile dirt track at Raleigh NC. NASCAR would also run upwards of fifty races a year, again with prize money that coincided with track size and attendance. The race for the championship would prove to be almost as much of a financial task as it was a driver/mechanic task due to the demanding length of the season. What made things easier for the teams that participated in the Grand National Series was the money that flowed from Detroit. Even the non-factory teams enjoyed the benefits of hand me down parts that were passed down from the bigger, better financed teams to the smaller independent teams. The shear number of races coupled with the many surface/size combinations also led to some surprise winners during the course of the seasons contested during the sixties. at the Jacksonville Speedway in Jacksonville, Fla., March 14. The division, which will have more than 20 races this year, blends the Grand National stock car of the last four model years with the lighter and quick Grand American cars. During 1971 a few events were run under this format and they quickly became popular with, the racing public. Following the opener on the half -mi le dirt track, the Grand National East competitors will travel to Kingsport, Tenn., for a 100-mile event on March 17 and Hickory, N.C., on March 19 for a $10.000 race. The Bold City 200 will be a 100-mile race worth $7,700 for 22 starters. If more than that number compete, the posted awards will increase up to a total of $9,300. The division will compete in at least nine states, including a Northern Tour which presently has dates at Malta and Islip, New York. One of the highlights of the season will be a 500-lap event at International Raceway Park in Ona, W. Va. The race carries posted awards of $17,525. During the 1971 season, Grand National races were held on weekdays as well as on weekends. Within the week of April 8 - 15, 1971, races were contested on the shorts tracks at Columbia SC, Greeneville SC and Smokey Mountain Raceway (Maryville) TN. The NASCAR Grand National Division also made an annual "Northern Tour" which consisted in 1971 of races at Malta NY, Islip NY and Trenton NJ, all held within a five day period. Of the 48 races contested in 1971, ten would be held on tracks that were smaller than 1/2 mile and 14 (excluding the Daytona 125's) would have posted distances of less than 250 miles. Unfortunately, the Detroit money began to dry-up in 1971, as marketing and perceived consumer demand caused funds to shift away from NASCAR. Car entries for some of the smaller prize money events shrank to the point that NASCAR allowed the smaller Grand American cars to enter some Grand National events. Grand American drivers Tiny Lund (Camaro) and Bobby Allison (Mustang) were winners of Grand National races during 1971. These victories have been debated by NASCAR for many years and at one time were not included in the victory totals for these two drivers since they were driving Grand American entries. The changing financial structure culminated in 1972, with NASCAR (along with series sponsor R. J. Reynolds / Winston) cutting all tracks shorter than 1/2 mile from the schedule as well as any race with a posted distance of less than 250 miles in length. 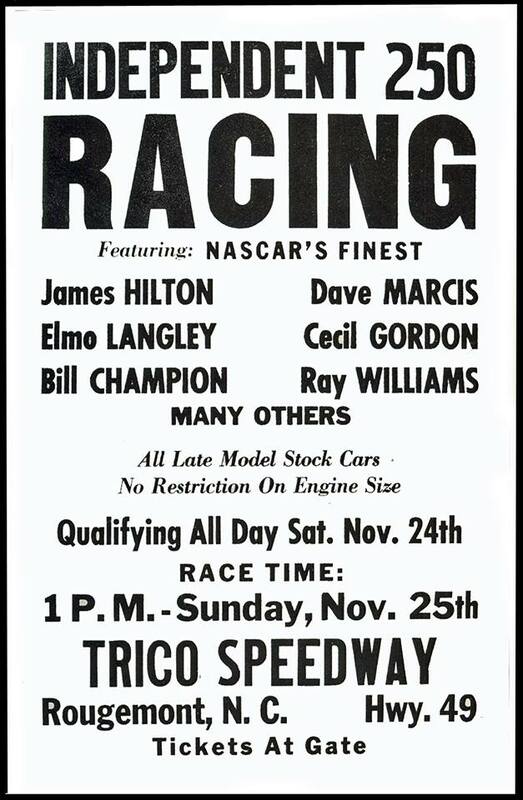 Gone from the 1971 schedule were Hickory NC, Columbia SC, Greenville-Pickens SC, Smokey Mountain Raceway (Maryville) TN, South Boston VA, New Ashville NC, Kingsport TN, Meyer Speedway (Houston) TX, Malta NY, Islip NY, West Virginia International (Ona) WV, Bowman-Gray (Winston-Salem) NC and Middle Georgia (Macon) GA. The 1972 Winston Cup would be contested over a 31 race season consisting of 20 superspeedway races, nine short track races and two road course races. Also, the two 125 mile qualifying races at Daytona would no longer count in the Grand National points total. To fill the racing void left at the tracks that were dropped from the 1972 schedule, NASCAR would establish the Grand National East Division. Grand National East would allow both Grand National and Grand American cars to participate as well as allowing 1969 models to compete in the series. In 1972, the championship would be contested over 15 races on primarily the tracks that had been dropped from the 1971 NASCAR Winston Cup Schedule. The only track that would host both Winston Cup and Grand National East would be Nashville's Fairgrounds Speedway. The two Grand National East seasons were very different in both competitor and locale structure. The 1972 season was conducted primarily in the southeast and included many of the Grand American competitors. 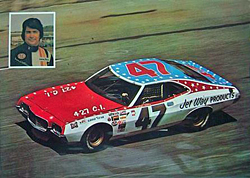 The 1973 season was evenly split between the southeast and the Midwest and included a substantial number of ARCA competitors along with eight races that were co-sanctioned with ARCA. The 1972 Grand National East season would began in Jacksonville FL, with a victory by David Pearson. The series winners for 1972, would for the most part be the upper echelon drivers from Winston Cup. Bobby Allison, David Pearson, Bobby Issac and Buddy Baker would win 10 of the 15 races held in 1972, while Grand National regulars Neil Castles and Elmo Langley would win three more. Max Berrier, a part-time Grand National Driver from the fifties, would win the other two races. Each race contained a fair number of Winston Cup drivers and cars and provided fans at the smaller tracks like Hickory and Kingsport, a chance to see their heroes race in person. Neil Castles would win the 1972 Grand National East title by a thin margin over NASCAR veteran Elmo Langley. Castles began racing in NASCAR in 1957 and had run Grand National full-time since 1964 with 51 top-5 finishes in 445 starts. Castles raced Dodges and Plymouths from his own stable during the season and would win at Greeneville-Pickens and Smokey Mountain Speedway as well as recording six second place finishes. 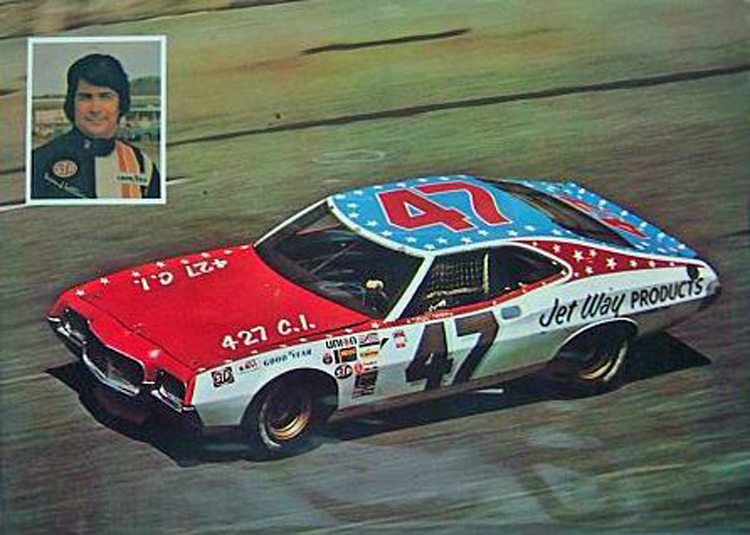 He would also compete in 21 Winston Cup races during 1972 and finished 30th in points. Elmo Langley started his Grand National career in 1954 and had ran the circuit full-time since 1964, with two victories and 60 top-five finishes in 406 starts. In 1972, Langley would win at Myrtle Beach SC and amass an amazing record of 13 top-five finishes in 14 races in Grand National East competition. Langley would also compete in 30 Winston Cup Series events and record one top-5 and nine top-10 finishes on the way to a seventh place position in points. Langley would serve as pace car driver for the NASCAR Winston Cup series until his death in November 1996. NASCAR Superstar and fan favorite Bobby Allison would also race in 10 Grand National East events during 1972. Allison captured victories at Hickory, West Virginia International, Nashville and Columbia in route to finishing 16th in points. Allison would compete in 31 Winston Cup races and win 10 on the road to a second place finish in the points standings. The Grand National East division races would draw a total attendance of 75,487 over the course of the 15 race season. The 1973 Grand National East season would begin much like the 1972 season had began with NASCAR stars Bobby Allison and Buddy Baker winning the first three races. Allison be victorious at Columbia while Baker would reign supreme at Hickory and Rougemount NC. The 1973 season would begin to differ as Grand National East and ARCA ran eight co-sanctioned events. The first two events were held on the dirt tracks at Selinsgrove PA and New Oxford PA. Both of these events were won by NASCAR'S Tiny Lund, driving a 1973 Camaro. ARCA drivers were well represented in the final results of both races, serving notice to the invading NASCAR brethren that they were going to be tough competitors on their home tracks. The end of June saw the Grand National East / ARCA contingent run three races in three days at West Chester OH, Toledo and Salem, Indiana. 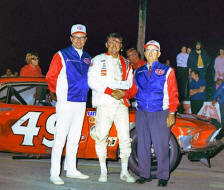 All three races were won by Midwest dirt track legend Bruce Gould of Cincinnati, Ohio driving a 1971 Ford Torino. At Toledo, Gould tied the 1969 ARCA track qualifying record of Les Snow with a lap of 92.402 mph. The victory at Salem would be Gould’s third straight ARCA series victory at the historic ½ mile track. Gould would go on to win a fourth straight Salem ARCA victory in 1974 and set a record that would not be broken until 2005 by ARCA RE/MAX legend Frank Kimmel. Gould, who would become ARCA’s 1973 rookie of the year, had beaten a topnotch group of ARCA talent as well as 1972 Grand National East champion Neil Castles and 1973 champion Tiny Lund. Lund would go on to win at Mt Clemens MI, while ARCA’s Tom Colella would at Carnegie PA.
On August 17, 1973, the combined ARCA and NASCAR drivers visited the 1/2-mile Berlin Speedway in Marne MI. The pole for the 100 lap race was won by Michigan's Bob Senneker with a speed of 100.614 mph. Senneker won the race driving a 1972 Chevrolet Chevelle with A. Arnold (1973 Camaro), Tiny Lund (1973 Camaro), Ron Hutcherson (1971 Ford) and Wayne Watercutter (1972 Chevrolet) rounding out the top five. Senneker averaged 67.496 mph in a 1972 Chevelle built by NASCAR legend Bobby Allison and owned by Pennsylvania native and ARCA competitor Tom Colella. However, the 1973 series title would belong to the legendary Dewayne "Tiny" Lund. Lund had dominated the Grand American Division until its demise in 1972. In 1973, Tiny would move to Grand National East and continue his dominate ways with wins at the last two races at Fayetteville NC and Hickory NC to go along with the three Midwest / ARCA events. Lund would compile 10 top-5 finishes in 14 races in route to capturing the 1973 championship. Tiny Lund began his NASCAR career in 1955 and had recorded five victories (including the 1963 Daytona 500) in 293 starts. 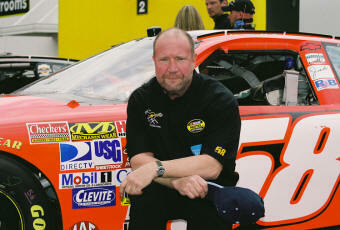 Lund also had recorded 54 top-five finishes and 119 top-10 finishes during his NASCAR Grand National career. The Grand National East division races would draw a total attendance of 75,487 over the course of the 15 race season. The series lasted for two years and proved to be the last breath for the Grand American cars as well as many of the old-line Grand National Tracks. NASCAR stated that a projected fuel crisis would cause it to cancel the Grand National East series for 1974. Little is published either in books or on the internet about this series. This website was constructed in order that neither this series nor its drivers will be forgotten.